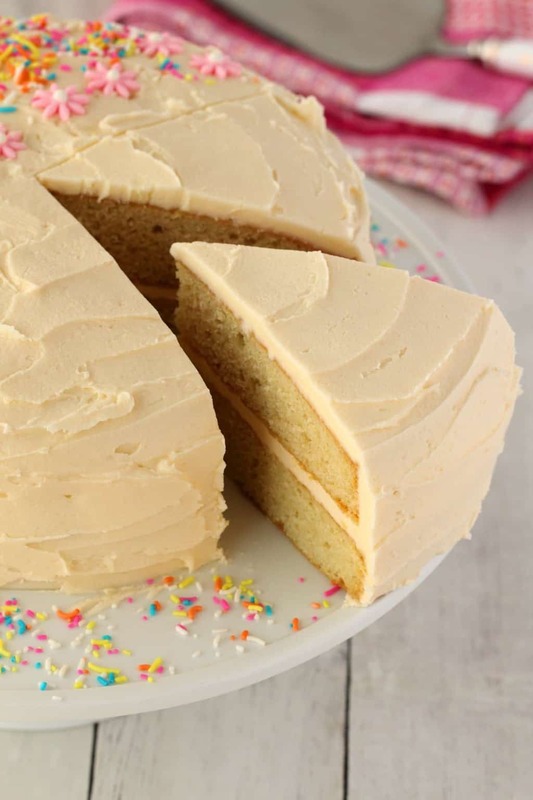 This vegan white cake is light and fluffy, spongey and perfect! 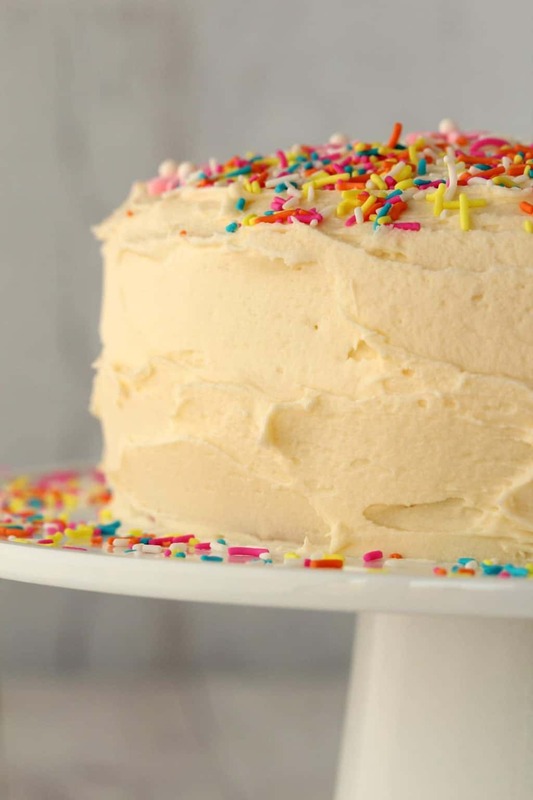 Topped with a simple white buttercream frosting (and sprinkles) it’s a super pretty cake that’s perfect for a special occasion. 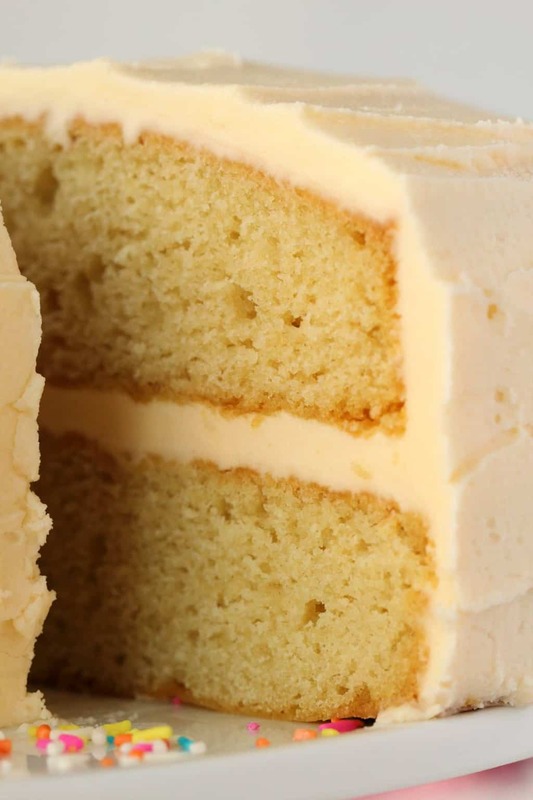 You might be wondering, what’s the difference between a white cake and a vanilla cake? Well…. not a whole lot really! 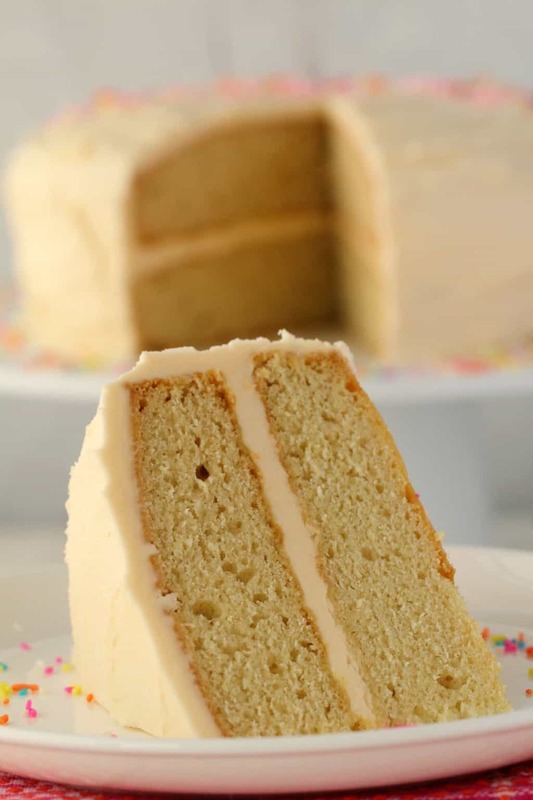 In fact this recipe is based on our super popular vegan vanilla cake recipe. 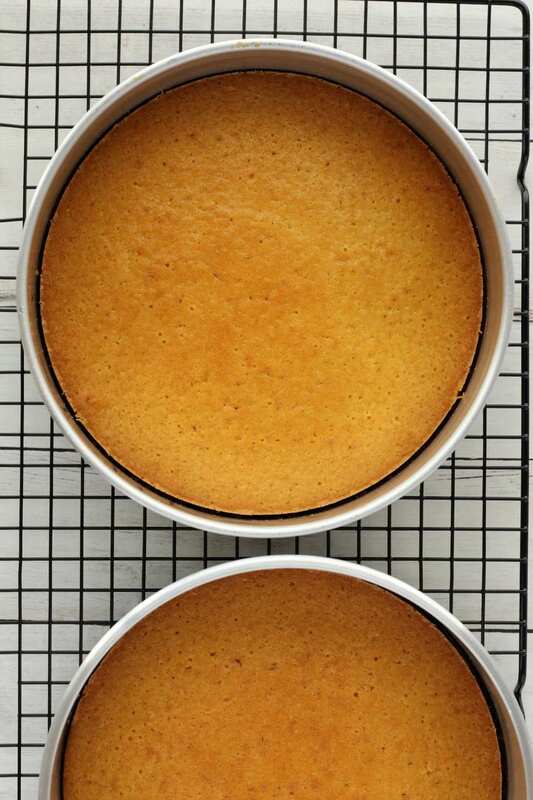 But while our vanilla cake uses 7 inch cake pans, this recipe uses 8 inch cake pans. 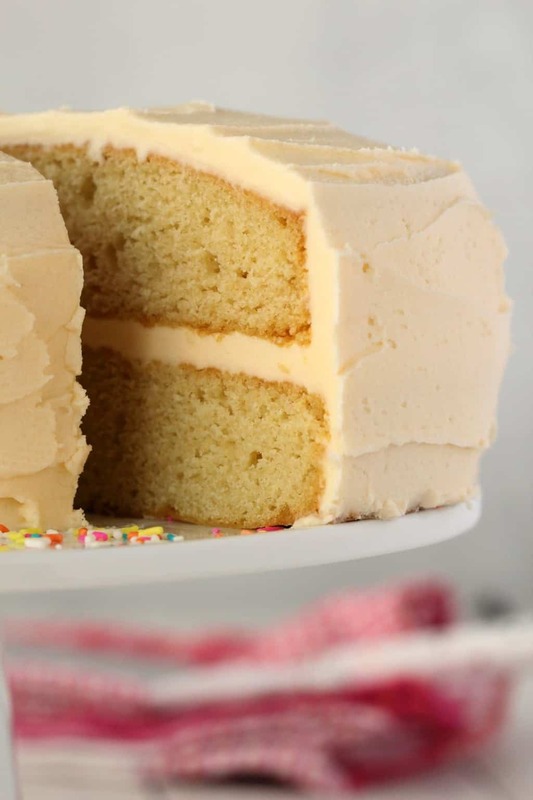 And the main difference between a vegan white cake and a vegan vanilla cake is just trying to make the color as light as possible (and you can use a little less vanilla flavoring too!). To make this white cake as white as possible, I used a clear vanilla extract, almond milk, which is very white in color, and coconut oil. I used virgin coconut oil, but if you don’t like the taste of coconut, you could use a refined coconut oil so you get the clear coconut oil without the flavor, but I do think coconut oil is a good fit here. However, if you’re allergic to coconut oil, another vegetable oil will do (such as canola or extra virgin olive oil), but the color won’t be quite as good. The frosting is a mix of powdered sugar, vegan butter, almond milk and clear vanilla extract. The frosting goes off-white as a result of the vegan butter, but once it’s on the cake you don’t notice that much anymore. And then decorate the cake with sprinkles! It has a bright and cheery, pretty, birthday party cake feel to it. If you wondered how I got my slices soooo neat like you see here, well…I refrigerated the cake (covered of course) overnight before we did the final photos. 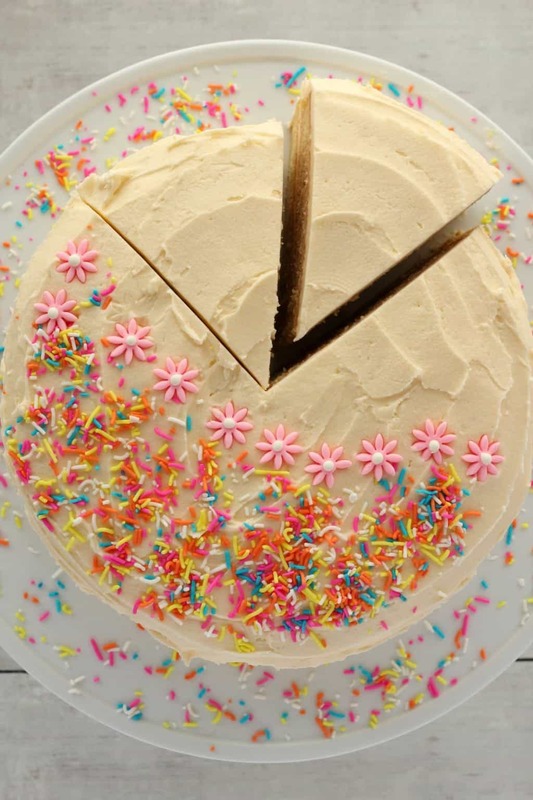 That allows for the perfect neat slicing, I don’t always do that for cake shoots, but I did it this time. It’s really not something that is necessary when you’re serving it to your friends and family, this is just for photo purposes. In fact, the cake is best the day it’s made, it’s soft and spongey and absolutely perfect. If the weather is hot, it can be good to refrigerate for an hour or two just to let the frosting set nicely, but covered at room temperature and super fresh is going to be the most impressive in terms of the perfect fluffy texture for this cake, though it does last a few days covered at room temperature (or up to a week covered in the fridge). 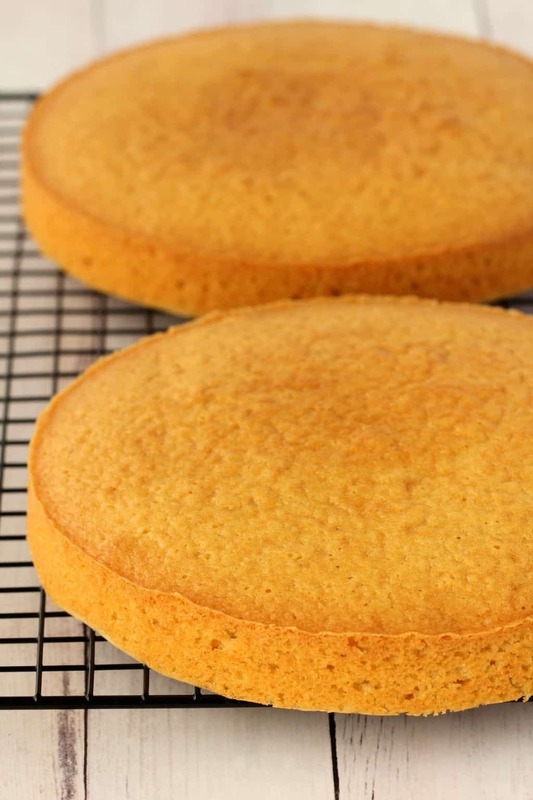 Remember to let your cakes cool completely before frosting and serving. If you try and frost a warm cake (or slice it) it can go quite wrong! So you have to have patience and let everything go completely cold. It’s also perfect for a special occasion and very kid-friendly too. 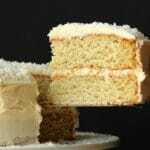 So what do you think of this vegan white cake? Tell us in the comments and please rate the recipe, thank you! Sign up to our email list to stay updated with all our latest (and greatest ) recipe posts and you’ll get a free dinner recipes ebook in the deal too! 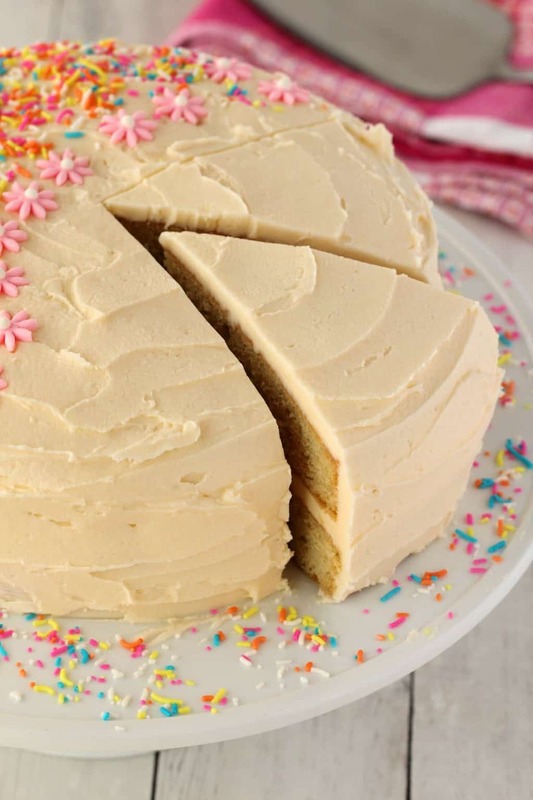 Light and fluffy vegan white cake with a gorgeous white buttercream frosting. 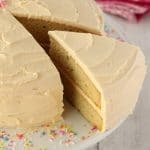 This soft and spongey 2-layer vegan cake is super easy to make with only 8 simple ingredients. Sift the flour into a mixing bowl and add the white sugar, baking soda and salt and mix together. Add the almond milk, melted coconut oil, white vinegar and clear vanilla extract and whisk in with a hand whisk until just combined, don’t overmix, tiny lumps are okay. 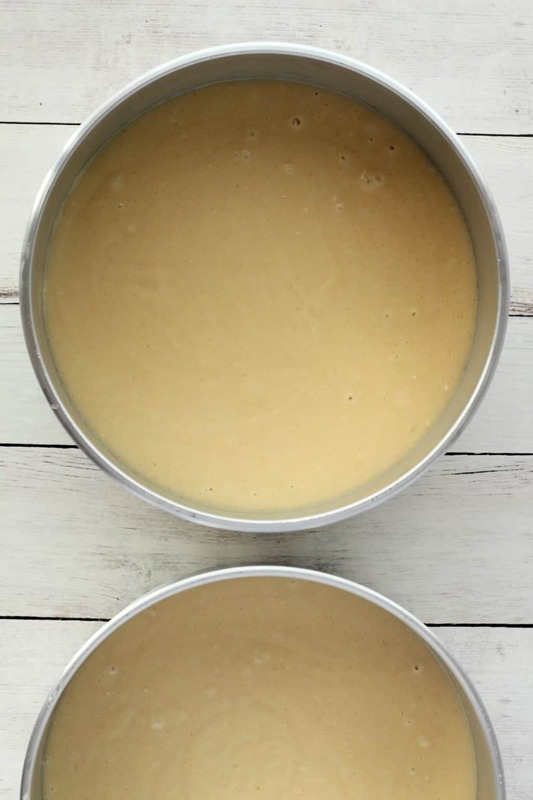 Divide the cake batter evenly between the two prepared cake pans and place into the oven to bake for 30 minutes or until a toothpick inserted into the center of one of the cakes comes out clean. 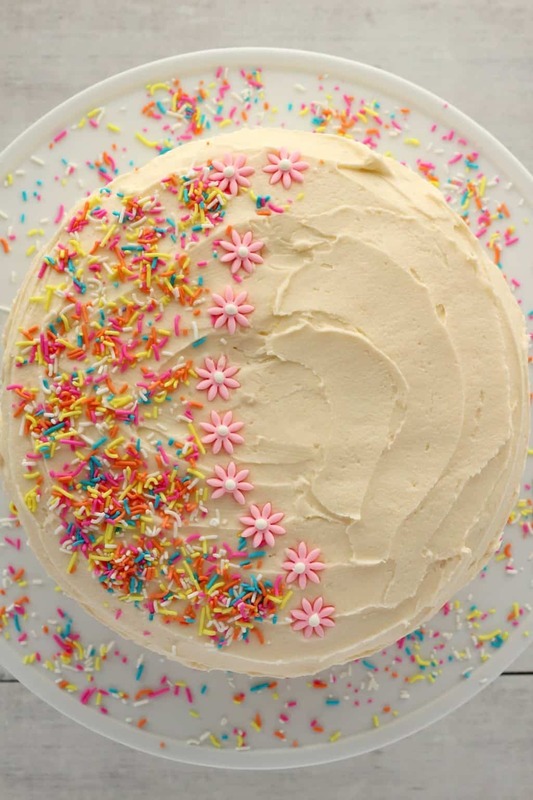 Frost the cake and decorate with sprinkles. *I prefer almond milk for this because it is so white in color, but coconut milk could be an option as well though I haven’t tested it. * Coconut oil works great here because of the color, but you can use either virgin coconut oil or refined coconut oil if you don’t want the taste of coconut. If you can’t use coconut oil for some reason you can switch it for a different vegetable oil with varying color results. 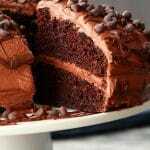 *The frosting makes a LOT, I really wanted nice thick layers of frosting, but you can reduce the quantity if you don’t want it as thick as you see in these photos. Previous Post: « Vegan Zucchini Muffins, Wholesome and Delicious! Genius! 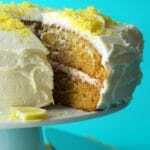 This cake looks so beautiful- another amazing recipe I’m sure. Where did you purchase your vegan sprinkles from if you don’t mind me asking ? If the frosting ended up to sweet…how can i lessen the sweetness? 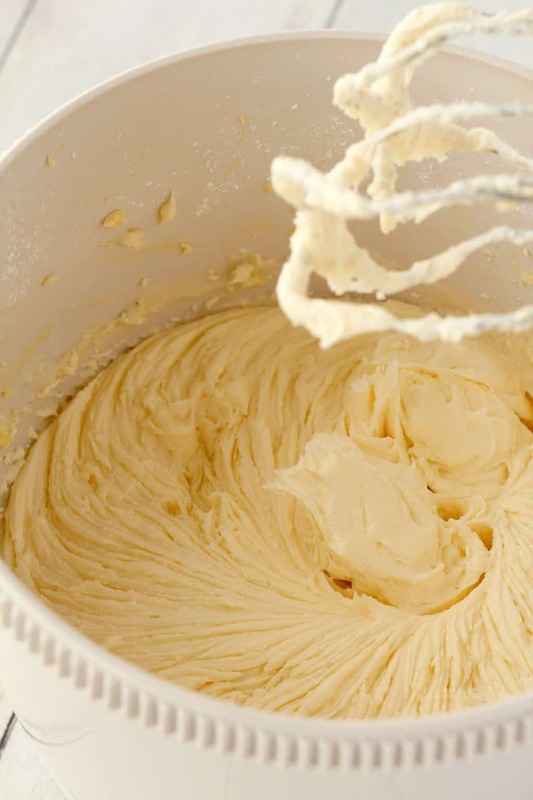 If you add a little bit of salt it should lessen the sweetness of the frosting. would this work ok with gluten-free flour blend? Hello! I wanted to make this for a baby’s 1st birthday. Can I use cane sugar, instead of granulated? I’ve made this cake for new year’s eve and it was amazing ! I love to cook and I think I’m not too bad (that’s what my friends say) but I never succeeded in desserts… until this time ! 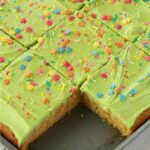 The recipe is so clear and so easy that my cake was awesome! I mixed few red fruits with sugar to make a grout and it was delicious. Just a little detail : the butter cream was a bit sandy-textured while I mixed it for at least five minutes. Is it normal or did I made something wrong ? Anyway, thanks a lot for your recipes and see you soon ! Thanks a lot for your answer ! When I read the recipe for the first time, I thought “powdered sugar” was what we call in french “sucre en poudre”, that means the white sugar we put in coffe or tea for example. But I remembered that a long time ago I made a cake with butter cream in which I used some “sucre glace”, that we can translate as “icy sugar”, and, a short research on a translator site confirmed me it was that sugar I got to use. So I used the right sugar. 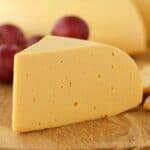 I used the vegetal butter just coming out of the fridge, do you think I should warm it a little bit before adding the sugar to integrating them better, and then cool the preparation before using it on the cake ? In my precedent post, maybe the word “sandy” was not right, I should said “very, very lightly granular”, and anyway, the most important is that the cake was absolutly delicious and I just wanted to know if I missed something. 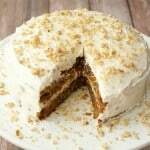 Can you make this cake with pastry flour instead of all purpose flour? This is delicious thank you for sharing! Do you have measurements for a 6” and 10” cake? Thank you!! Ok perfect!! Thank you very much!! Awesome. 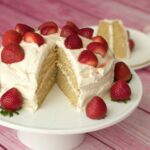 I wanted to make a mini layered cake and this recipe made the perfect amount of cake and frosting. I added a 1/2 tsp cinnamon and used Apple Cider Vinegar to as I wanted to give it a little more flavour and it worked perfectly. I used Kremelta for the frosting and again, I perfect result. Thank you for this super easy recipe. Have a question. Can I use cake flour instead of APF? 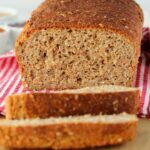 Gluten-free all purpose flour is a good choice for making this gluten-free but it often isn’t the only change you need to make and often oven times will vary when you’re adapting a recipe for gluten-free. I would leave it for even longer next time and make sure it passes the toothpick test (no wet crumbs on the toothpick when inserted into the center of the cake). I am truly impressed. 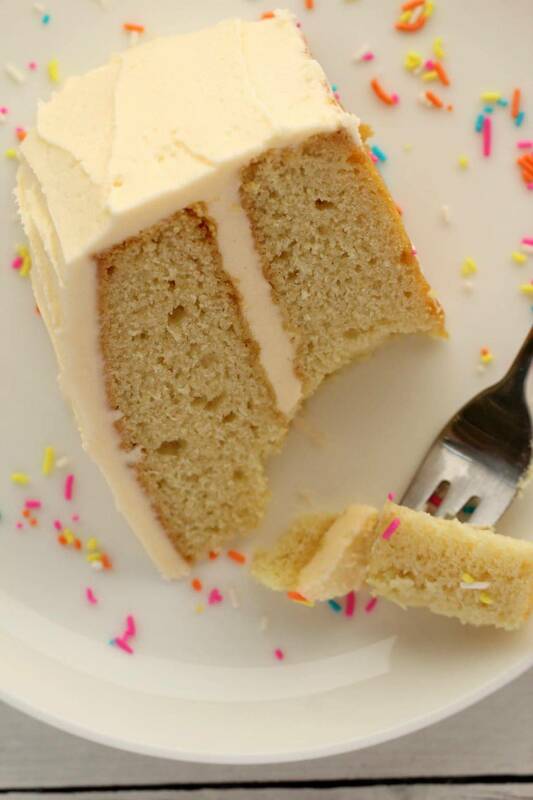 Not only is this cake flavorful but it is perfectly moist. When I first cut into it (the day after baking it) I was a little sad because it *looked* dry but my family assured me that it was perfect!!! Then I had a piece and well… I wanted to finish the cake off all by myself :)Thank you for adding this to our lives!!!! Hi Michele, so happy to hear it was a hit! And so glad it wasn’t dry! I also look at my pictures now and think, hmmm, does it look dry? But I know it wasn’t dry! Hahaha, anyway thanks a million for the awesome review and so glad it was enjoyed. Hi Alison, this looks great! I love all of your cake recipes. 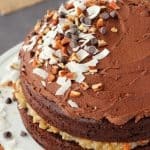 Best vegan cakes ever! Do you know how many cups of batter this makes? 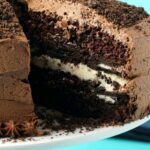 Would I be able to make this in a sheet cake pan? First of all, thank you for your amazing website. I made this cake with water in substitution of almond milk and sunflower oil in substitution of coconut oil and it turn out very good and fluffy! I have a question.I put some chocolate chips in the batter but they sank to the bottom of the pan. Do you have any suggestion for the chocolate chips stay in the middle of the batter? Thank you so much for your answer! 🙂 I will try it!